Even though coffee does not grow in our part of the world, Europeans love coffee. There are people who cannot imagine starting a day without it. This might be due to the coffee's effect on staying awake as well as due to its social role or both. The fast boosting effect of coffee is favourable in the morning while in the afternoon most people need a source of long-lasting energy that keeps their concentration and motivation for after lunch work or after work recreation. These needs can perfectly be served by guarana. Guarana is a climbing plant in the maple family, native to the Amazon basin and especially common in Brazil. It is best known for the seeds from its fruit, which are about the size of a coffee bean and have a caffeine content more than twice as high as coffee beans. One of the main advantages of guarana over coffee is the duration of its effect on one's body. Guarana energy is much longer lasting than coffee, plus the stimulation is less jittery and clearer in character. Guarana is absorbed slowly by the body. This results in a long-lasting energy release over hours - a stark contrast to the fast rush and crash experienced with coffee. Therefor you can feel the effects of guarana for as long as 4 to 6 hours. Slowly released energy has a positive effect on concentration and focus, which makes guarana ideal for all situations in which you need to keep your mind sharp and your brain open for new knowledge. If you imagine coffee and guarana as a water-skier, coffee represents the engine of a boat, which has to pull the skier out of the water with high power, while guarana is the skier, who has to retain concentration and strength in order to enjoy skiing for as long as it gets. Who wouldn’t want to enjoy in everything he/she does for hours? Find out, how this works with one of our products, containing guarana. You can choose Guarana natural energy in capsules or as a solution, packed in practical 9 ml bottles. Both of them also contain niacin (vitamin B3), which contributes to the reduction of tiredness and fatigue and to normal energy-yielding metabolism. If you are seeking a natural source of energy for long-lasting sport activities, try our Guarana natural energy sport. It contains 100 mg of natural guarana caffeine and a bunch of vitamins, contributing to normal function of the muscles and immune system. 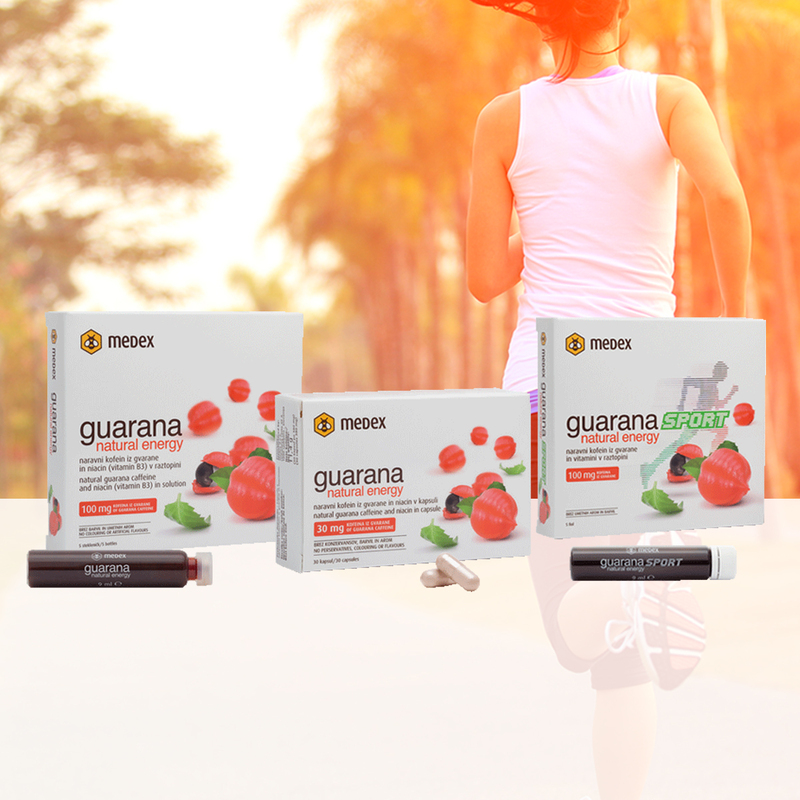 Guarana natural energy sport comes in plastic vials, which make them even more sport-friendly. Next time you will be faced with physically or mentally hard work, remember Guarana natural energy and the joy it can bring to your activities. We will be glad to hear, how it worked for you.